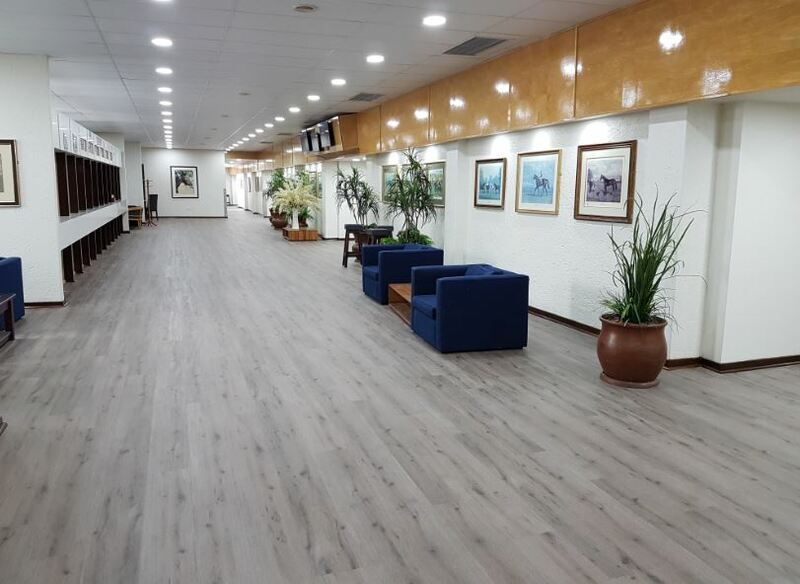 The Turffontein Race Course in Johannesburg recently underwent an upgrade. The Private Box and VIP betting areas of the race course were re-shod in order to give these areas a facelift. Traviata’s “IsoCore” Swiss Oak Bern flooring was specified for the project. The new natural emboss offers a surface which looks authentic, is 100% waterproof and will be very easy to maintain for years to come. The “Drop-Lock 100” system allowed the more than 650 square meters of flooring to be laid in less than three days. Another big time saving was that no floor preparation was necessary before laying the new floor thanks to the added lightness and rigidity of the system. The dimensional stability of the board, combined with the site conditions at the Turffontein Race Course – the area is temperature is controlled and there is no direct sunlight – allowed for the floor to extend over 55m without the need for any expansion profiles that could negatively impact the aesthetics. The design team was particularly pleased with the degree of flow that IsoCore was able to offer the project.